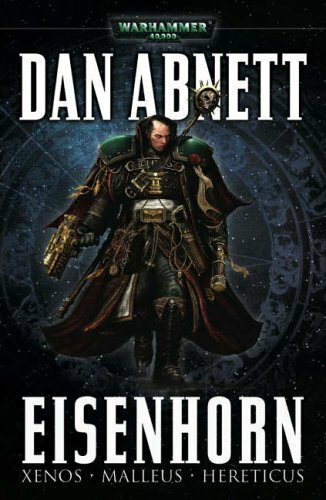 The Eisenhorn Trilogy by Dan Abnett is a set of stories that takes place in the universe of Warhammer 40K. The universe is one created for tabletop gaming (learn more here). I have read in many places that these novels are a great entry point, and I’d have to agree because they are the first I read that were set in this universe. The trilogy follows the footsteps of Gregor Eisenhorn, an Inquisitor whose job it is to hunt down heretics, xenos (aliens), and the like (daemons, etc.). It is a perfect set up for a story with lots of fighting and intrigue, and Abnett delivers on both. Throughout the books, readers are treated to plenty of twists and turns, and the overarching plot is superb. It’s an absolute blast to read these books and engage in the plot. The books are also filled with a slew of terminology, characters, and references to events which are not always explained. Many of these are from the overall 40k universe, and many of them are clearly borrowed from the language of Christianity. This means that although the book is often recommended as an entry point, it still has a pretty steep learning curve at points. Expect to either be looking things up a few times or just not fully knowing what’s happening or being referenced. At times, too, some side characters do not seem to get enough development. There’s awareness that they are there and generally who they are, but Abnett doesn’t often go beyond that. Despite a sometimes steep learning curve, the Eisenhorn Trilogy is a fantastic place to enter the Warhammer 40K universe. Filled with action and adventure, with a hefty helping of deception and plot twists, the trilogy is an enthralling read. Trust me, you won’t look back. If you like science fiction with lots of action, Abnett is a must-read. Dan Abnett, Eisenhorn (Black Library, 2005). The whole movie should have been in this setting. I have embarked on a quest to watch a number of 80s Fantasy flicks and share my findings with you, dear readers. 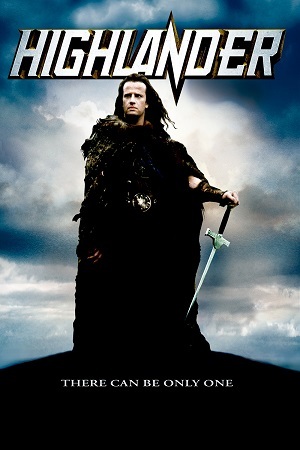 Here, we look at “Highlander.” I have not seen this movie before, but like just about everyone, I know THE quote: “There can only be one…” so it’s kind of like I’ve seen it. Okay, not really. Onto the review! Highlander giveth, and Highlander taketh away. The film has some scenes that are fantastic, but other scenes are just disastrous. The depiction of MacCleod’s wife growing old and dying was really touching, for example. But other scenes are drivel, such as the scene with the Kurgan driving like a maniac. It just makes me wonder what the heck the point of it is. The background story is intriguing and built up well, but then largely abandoned (what happened in the intervening years?). Frankly, if the film had only been about the discovery of immortality, it would have been better. Perhaps it just bites off more than it can chew as far as the time it is supposed to cover is concerned. The concept of these immortals having to go around killing each other is a bit underdeveloped as well. Why? Other than the “Prize,” what have they to gain from it? Why must there only be one? Why can’t we all just get along? Alas, we are never treated with further explanation because we have to get dragged back into the 80s to fight Kurgan. On paper, it’s a good concept, but in practice I was left just wishing for more plot and less absurdity. We just never get a chance to see whether the film is Braveheart or the Matrix, and I wish that the two points had melded together better. It really does have the feel of an awesome, epic movie at several points–during the training montage, for example–but then it is just dragged down by silliness. The world has a true feel of lore to it and behind the scenes, but I was left feeling like the curtain was never fully pulled away to see that lore. The hints we get in the flashback scenes are awesome, and the way the movie very slowly gives hints of what’s happening is actually really well done, but all the potential never fully comes to fruition. Indeed, it seems to me that most of the “modern” scenes in the 80s are unnecessary and frankly kind of silly. We never get a sense of why the gathering of the Immortals needs to happen at that point in history or why there are so few remaining. I really wanted to love this movie, and it fed me plenty of potential for me to love it, but it just didn’t cash in. One of the most inconsistent and frustrating movies I’ve seen. Lots of potential and some cool scenes make me not sad I watched it, but I could stand to skip about 1/2 the movie and then have that 1/2 filled in with more cashing in on the premise. Surprise! I’m dropping your son off with you with no notice! On the way to try to resolve an environmental disaster on a nearby planet, the Enterprise encounters a time distortion. It turns out to be an apparent time traveler in a super advanced ship. The traveler, Berlinghoff Rasmussen, claims to be a historian and wants to observe the crew of the Enterprise going about daily routines. Things are not as they seem, however, as it turns out a major planetary crisis is developing on Penthera IV. Not only that, but Rasmussen appears to be taking things. After Picard tries to enlist Rasmussen’s help in making a decision, a major risk manages to save the planet and all the lives thereon. Rasmussen decides to leave, but is confronted and exposed for stealing various items from the Enterprise. It turns out he is, in fact, from the past and not the future but stole the vessel from a traveler in the future. The ship disappears and Rasmussen is stuck in his future. Boom! Plot twist! That was a great ending in an episode that made me think I had it pretty much all figured out. From the start I was suspicious of Rasmussen’s story, but I couldn’t quite put my finger on it. By the end, I thought that he was either actually from the future but not a historian or a straight fraud. But to have him be from the past and in a ship from the future? That’s the kind of twist that both surprised me and made me think it totally fit the episode. Rasmussen’s character is well-acted as well, with enough mix of eccentricity and annoying traits to make a convincing character. When the twist is sprung at the end, it seems entirely believable for his character to be so underhanded. The scene in which Picard tries to get Rasmussen to help make a decision to save millions of lives was intense. Picard’s response to Rasmussen saying it would be a shame if all the people died is perfection: “Yes, it would be. It would be quite a shame.” The false smile he has plastered on his face with the delivery just proves again that Patrick Stewart is a phenomenal actor. Well done! This isn’t in the all-time great tier of episodes, but it is a solidly-acted episode with a great twist and good plot. I don’t really have anything to complain about. Another winner on the time-travel front from TNG. As the Enterprise participates in a test for a new technology to facilitate Warp Speed traveling, Worf’s mom shows up with his son, Alexander, for a visit. It turns out she has decided Alexander needs to stay with Worf. As the experiment with Warp goes awry, Worf must struggle with the difficulties of relating to a son he hardly knows and who appears to have some discipline problems. Worf decides to send him to Klingon School, but an emergency cuts off their fight over the issue. When the Enterprise takes damage, Worf and Riker must try to save Alexander before Picard has to pull the trigger to save a colony. 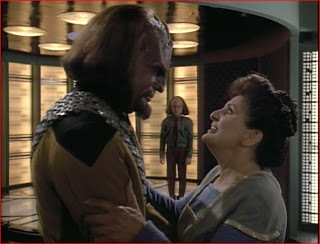 Worf, with parental adrenaline, saves Alexander and decides he can stay on the ship with him. First off, there is a really awesome scene here with Geordi getting all pumped up about making scientific history while Worf and Data are completely not pumped. Geordi tries his best to get them excited, but their deadpan deliveries of their lines was hilariously appropriate. Poor Geordi. I thought it was a cool scientific moment! Anyway, this episode does a great job combining the plot points in a way that the main plot–Worf learning about parenting–is never overshadowed nor drowns out the secondary plot–new Warp technology. This is a pretty deep episode when you think about it at all, because Worf hasn’t really taken the time to get to know his son (his inability to tell the teacher Alexander’s birthday was a poignant reminder of this). That’s a pretty tough flaw to swallow for a character who is one of my favorites, but the story of “New Ground” helps vindicate him a bit. Worf continually tries to make what he thinks are the best decisions regarding his son’s health and life, but it seems like he hasn’t always succeeded. The increasing tension from the secondary plot allows us to explore this dimension with some real consequences and tension. The involvement of seemingly the whole crew in Worf’s struggle was contrived at points, but still helpful. Troi’s interest, in particular, seemed genuine and touching. When Worf finally decides to let Alexander stay with him, viewers can breathe a sigh of relief and feel that confidence in Worf is not ill-placed. Finally, when I was little I loved this episode because of the field trip. I thought it was so cool to get insight into what field trips would look like in the future. Weirdly, they look an awful lot like they do today, but with cooler animals. Who knew? I have embarked on a quest to read through the Star Wars Expanded Universe once more. Be sure to check the linked text there to see other posts in this series. Here, we go back to the future to see the origins of Han Solo with book one of the Han Solo Trilogy, The Paradise Snare by A.C. Crispin. Who doesn’t love to get some background into their favorite characters? (Put your hand down, you!) Seriously, it’s always exciting to learn more about beloved characters’ pasts, though it is sometimes with some trepidation that we explore, hoping our image of them will not be shattered. A.C. Crispin’s “Han Solo Trilogy” is an origin story for everyone’s favorite scoundrel, Han Solo. One of the most problematic plot devices, in my opinion, is what I have dubbed the “kill a ‘protagonist’ handle.” Okay, I just made that up. But what I mean by it is a reference to when authors start off a book by introducing a character who is clearly a “good guy” and then killing them fairly briefly. Why is this such a problem? The reason is because we haven’t been given any reason to care about the character before they die, so it is not as impactful as the death of a character should be. This happens in The Paradise Snare with Dewlanna, the Wookie who took care of a young Han Solo. I’m glad Crispin developed Dewlanna’s backstory more through Han’s reflections, as this softened the contrived feeling a bit. The Paradise Snare is a pretty sweet concept too. As I said, origin stories are usually pretty thrilling, and ever since I first saw the movies I felt there was more to the story of Han Solo than met the eye. It’s good to get this development into the past to ground some of the aspects of his personality. Moreover, Crispin did an excellent job capturing the “feel” of Star Wars and Solo in particular. The dialogue is very well written throughout, something that is not always the case in the Star Wars universe *cough* prequel trilogy *cough*. Solo seems like a very real character, with differing motivations, reactions, and actions that all seem to fit with what we already know as Star Wars fans. Moreover, he can act in unexpected ways that nevertheless seem to fit his character. Bria, another Corellian, is also fairly well-developed, though we don’t get to spend as much time with her as we do with Han (for obvious reasons). Most other characters feel very tertiary and have little motivating them. I think this is more a product of the purpose of the book and its focus on Han than anything else, however. Crispin captured the feeling of Solo very well. One thing that was a downside throughout was that none of the locations seemed particularly developed. There were some descriptions, yes, but overall the different planets almost all felt like mere wallpaper for the story to occur in front of. One of the great things about Star Wars is all the diversity of planets, and although Crispin did capture this at moments, it most often seemed like there wasn’t much to hold on to so far as the settings were concerned. It’s always tough to grade a childhood favorite, and I loved the Han Solo trilogy. There are a few problems in the book, sure, but the question is what is it that readers are looking for in such a trilogy. The answer is some good action, development of the character we’ve grown to love, and a solid story. The Paradise Snare checks out on each front. A strong start to the series. I was a fan of the R2 unit on the ship Solo stowed away on threatening to have him arrested on arrival. 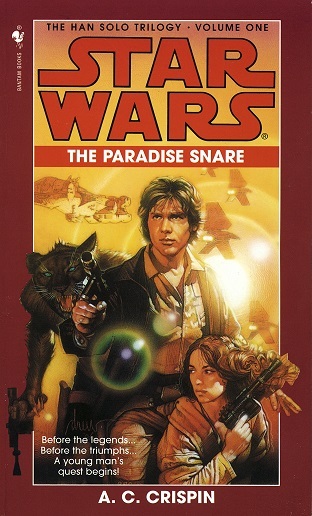 The Paradise Snare is a solid beginning of the origins of Han Solo.